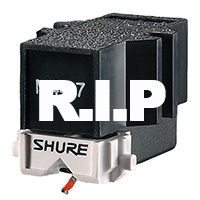 In an statement sure to strike a chill into many a deejay’s heart – especially turntablists – Shure today announced discontinuation of all their phono products from summer 2018. The announcement contained echoes of Technics’ 2010 revelation that they were ceasing production of their SL1200 and 1210 turntables. While Technics blamed dwindling parts suppliers however, Shure were somewhat less specific saying that it was becoming increasingly difficult to maintain their exacting standards of manufacture leading to, “cost and delivery impacts that are inconsistent with the Shure brand promise.” Still, if what happened with Technics is any guide, we can look forward to a relaunched line of Shure phono products in 2024 at twice the current price. Read Shure’s full statement HERE.